The openly gay leader of the Scottish Conservatives has hit out at homophobic abuse directed at her online. Ruth Davidson said the language used had been unacceptable, and urged people to join her in challenging such abuse when they see it. She spoke out after secondary teachers said homophobic bullying was still rife in schools. Scottish ministers said they aimed to ensure every child and young person grew up free from bullying. Ms Davidson said she had a responsibility to challenge the homophobic abuse she was sent through social media sites like Twitter and Facebook. Writing in the Daily Record newspaper, the MSP gave examples of some of the messages which she had received. She said: "I don't want young LGBT people reading my timeline and thinking that sort of language is OK. I don't want them believing that the only response is to just sit passively and take it. "We can help young people by calling out this abuse when we see it. We'd never let casual racism go unchallenged, so why is casual homophobia given a free pass?" 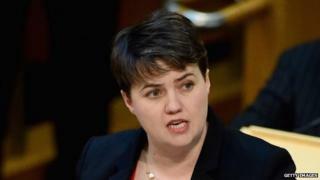 Ms Davidson's comments came in the wake of a poll suggesting nine in 10 secondary school teachers in Scotland said homophobic bullying happened in their school. The YouGov survey, commissioned by Stonewall Scotland, also claimed a third of teachers heard homophobic language from other staff. A Scottish government spokesman said: "We want every child and young person in Scotland to grow up free from bullying and we want them to develop mutually respectful, responsible and confident relationships with other children, young people and adults. "Our national approach to anti-bullying sets out a common vision and aims to make sure that work across all agencies and communities is jointly focused on tackling bullying."